PHUKET: Soft music from a classical guitar proved to be the ideal accompaniment for the paintings showcased on the walls of the VR Gallery of Mom Tri’s Villa Royale in Kata Noi this month. April 28 was the opening night of the exhibition of gentle and whimsical paintings by Somrak Maneemai. Many of his pieces contain tiny figures of children dancing and jumping along with lots of other incredibly detailed minutia. Guitarist Suparp Wongwasana sits on a wooden designer bench in the middle of the small gallery, seemingly being lifted up in the middle of a cloud of musical notes rising from his deftly plucking fingers. The night proceeds with a sort of stiff competition between the music and the paintings, battles fought and won and lost every minute as people arrive to view the art. Originally from Nakhon Si Thammarat, quietly-spoken Suparp (meaning ‘polite’ in Thai) has been living in Phuket for six years. 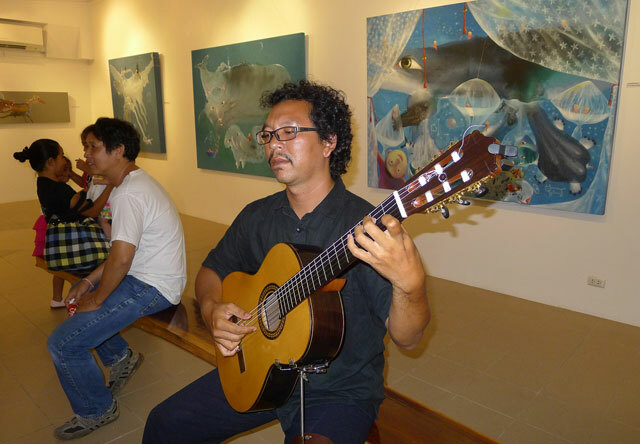 The musician teaches guitar to 10 regular students on most days at the local Kru U music school in Phuket Town. He also regularly plays for hotel guests at ‘By The Sea’ at the Evason Phuket Resort in Rawai. He learned guitar and ukulele at a nationwide chain of musical schools and now enjoys being a teacher of guitar himself. He says his students are keen learners who are all studying to read music as part of their lessons, but unless they can practice regularly, Suparp says, it takes a long time to learn the skill. Contact Mr Suparp on 085 470 8616.